For anyone out there with a To Be Read list that seems like it will never end, this challenge is for you! This is all about making your own personal list of books 5? 10? 20? 30? more? that you want to commit to reading in 2017. Books can be published in any year, be from any genre, and from any category: adult, YA, MG, Graphics, NF, etc titles. All that matters is that they are books you want to be sure not to forget as that TBR list continues to grow! These aren’t the only titles you will read over the year, but a list to help guide your reading. A list to lure you back to a reading path you have set for yourself. Many, many new books will tempt you! Go ahead and read them but having a list like this ensures you will not forget some titles you were determined to read. If you would like to create and share a list, contact me on twitter (@CarrieGelson) or leave a link in the comments and I will add your list to the #MustReadin2017 lists below. Everyone is welcome! I will update regularly so if you are just seeing this now – go make a list! We’ll be waiting for you. Someone asked me about the image for this year – this was taken in my classroom early one morning. Two students were scanning the shelves adding to their To Read lists as they talked titles, authors and genres. I thought this perfectly represented how each of us has been searching on-line and actual book shelves, book blogs and book lists to create personal #MustReadin2017 lists! Deb Frazier joins in to start to take control of her To Be Read Shelf. Her list is here. 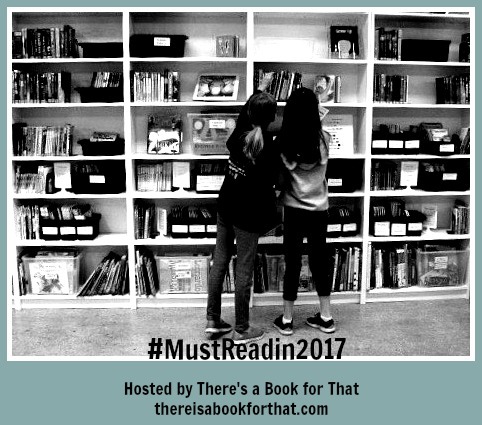 This entry was posted in Must Read lists and tagged #MustReadin2017 by carriegelson. Bookmark the permalink. Hi, Carrie! I am excited to join the community this year! I’m looking forward to seeing what others are planning on reading this year. Here is my link: http://www.literacyonthemind.com/2017/01/what-i-will-be-reading-in-2017.html Thanks! Can’t wait to look at everyone’s list later today! And now I’m off to read what others are going to read and add to my Goodreads “Want to Read” shelf. Thank you! Okay, now I am going to look at the other lists. Carrie, this is just what I needed. My big goal in 2017 is to grow my middle-grade book bank. I’ve decided to take a plan I had for reading in the new year and jump into this event. I know having a community — and a bit more accountability — will keep me on track. Thank you. Thank you. I’m so excited to start a new year! I know I’m so tardy! But I’m going through these links right now, building a new TBR list. This reading opportunity was perfect for me to jump start my reading this year! Yikes! I hope it’s never too late! I am a primary teacher in central Ohio. My list includes professional books, books on equal rights, and fiction picture books. I am off to a great start reading one book yesterday! Thank you for hosting and motivating so many! We share a few titles! The second I finished my graphic, I regretted not including American Street. I suspect it may be the first book I read because of that deep regret. HA!